Idiopathic CD4+ T-cell lymphocytopenia (ICL) is a rare disorder of immune system with heterogeneous clinical manifestations and immunologic profile. This is a rare condition, which was first defined in 1992 by the Centers for Disease Control and Prevention. It is marked by a CD4 count that is <300 cells/mm3 without human immunodeficiency virus (HIV) infection. Its course differs from that of acquired immunodeficiency syndrome (AIDS), although patients with this disorder may develop opportunistic infections. Hence, the clinicians should be aware of this rare immunologic disorder and that a decrease in the CD4 count is not a hallmark for HIV infection, but could be due to other idiopathic causes as well. Autoimmune manifestations have long been perceived as paradoxical in patients with primary immune deficiencies (PIDs). More than 100 cases of PID have been identified so far. Human immunodeficiency virus (HIV) infection is known to be typically characterized by a profound depression in CD4' lymphocyte numbers in peripheral blood. [l],,,,, It is now clear that infection with HIV I & II can result in depletion of CD4 T – helper lymphocytes and development of AIDS. In the past 10–12 years, several groups have been described as HIV negative patients with CD4 lymphocyte depletion in conjunction with opportunistic infections or Kaposi sarcoma termed as idiopathic CD4 T-lymphocytopenia (ICL). Absence of any defined immune deficiency disease or therapy associated with depressed levels of CD4+ T lymphocytes. Idiopathic CD4 lymphocytopenia is a rare immunodeficiency of unknown cause that clinically closely resembles a HIV infection, but the absence of this and related viruses by means of all serologic and molecular methods of detection is a crucial element of the case definition. Patients have persistently low CD4 T-cell counts (<300 cells/mm3) and experience opportunistic infections, autoimmune disease, and hematologic malignancies. The etiology of ICL is not clear., In some cases, low CD4 T lymphocyte counts may reflect transient responses to infections or other conditions or even normal clinical status in asymptomatic patients. In other patients, low CD8 T lymphocyte counts and low immunoglobulin levels (especially IgG) cause suspicion of possible generalized immunodeficiency disorders. ICL may be found in some patients with diseases associated with immunosuppression (Kaposi's sarcoma), and lymphoma., There is no evidence for a transmissible agent or an environmental cause of the disease., The loss of naive T-cells, decreased CD127 (IL-7 receptor) expression, together with increased serum IL-7 have been postulated to be the cause. Sexual and household contacts are not affected and persons who donated blood to the affected patients showed normal CD4 T lymphocyte counts. There is no geographic clustering of affected patients. ICL is a condition of unknown etiology and is considered as a heterogeneous syndrome possibly encompassing different disorders sharing a common feature of reduced circulating CD4 T-cell counts. Heterogeneous immunologic profiles have been reported so far in ICL patients. Mechanistic studies of T-cell function in ICL remain scarce. Decreased T-cell responses as well as increased T-cell activation have been reported., The failure of CD4 T-cell homeostasis in ICL could be attributed to decreased production, increased destruction, tissue sequestration, or any combination of these. CD8 T-cell counts remain in the normal range or are often decreased in ICL. Functional investigations have revealed an increased propensity of ICL T cells to undergo apoptosis, a process partially dependent on FAS expression., Markers for activation and turnover are increased in CD4 T cells but not in CD8 T cells, pointing at a specific alteration of the CD4 T-cell compartment. Another factor that may contribute to the CD4 T-cell defect is a decreased clonogenic capacity of the bone marrow (BM) in ICL patients. A frequent alteration observed in ICL consists of increased levels of IL-7 in peripheral blood, consistent with the triggering of a homeostatic response to restore normal CD4 T-cell counts., qw The literature indicates that neither human retroviruses (HIV-1, HIV-2, HTLV-I, or HTLV-II) nor other transmissible agents play a role in the pathogenesis of ICL.,, Patients with ICL are registered worldwide. The underlying pathophysiology of this unusual disorder is yet to be ascertained conclusively. Infectious etiology has been ruled out. Some researchers have considered ICL to be an extreme of the spectrum of common variable immunodeficiency. The recent views on potential mechanism for CD4 depletion include FAS/FAS ligand over expression leading to apoptosis defective cytokine (tumor necrosis factor and interferon-gamma) production, regenerative failure of hematopoietic stem/progenitor cells, impaired thymic T-cell maturation, and autoantibody against CD4 cells. The molecular basis of ICL is still unknown. It has been hypothesized that expression or function of CXCR4 could be altered in ICL CD4_ T cells. Absence of any defined immunodeficiency or therapy associated with T-cell depletion. ICL was initially considered to be an extremely rare syndrome., There are numerous reports of ICL associated with different diseases and clinical conditions.,, Opportunistic infections, mostly seen in HIV patients, are the most common among them.,,,,, Patients have persistently low CD4 T-cell counts (<300 cells/mms3) and experience opportunistic infections, autoimmune disease, and hematologic malignancies. Clinically ICL may present with a spectrum ranging from asymptomatic to serious infections [Table 1]. Opportunistic infections like candida, cytomegalovirus, and Mycobacterium tuberculosis have been described in adult patients with ICL. Reports have suggested that around 50% of these patients demonstrate at least one skin manifestation ranging from infections to atopic dermatitis to basal cell carcinoma. 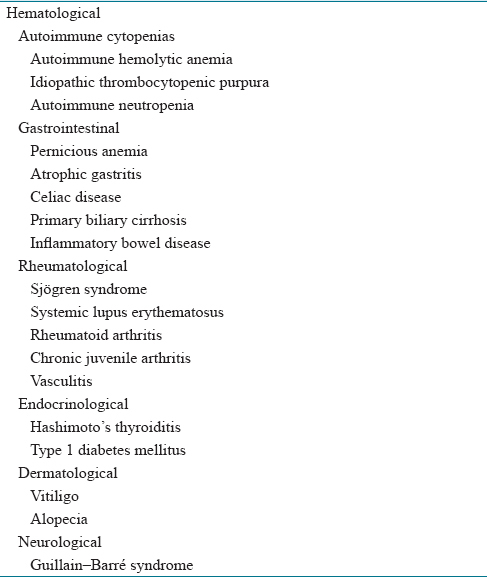 Manifestations of proven or suspected autoimmune mechanism associated with common variable immunodeficiency. Aside from the low CD4 lymphocyte counts, immunologic findings in these patients are distinct from abnormalities found in HIV infection. In general, immunologic evaluation might only reveal reduction in the number or activity of NK cells (CD32, CD161, or CD56), with the preservation of T cells and B cells. A very small percentage of patients with ICL have hypergammaglobulinemia that is typically seen in HIV-infected patients. Almost all of them have normal or slightly low levels of immunoglobulins., As compared to HIV-infected, these patients have lower counts of CD8 cells and more lymphopenia. CD4 CT-cells counts are relatively stable, without progression over time., In these patients, care should be taken to exclude other immunodeficiencies known to be associated with defects of NK cell number or function, such as severe combined immunodeficiency (SCID), Chédiak–Higashi syndrome, X-linked lymphoproliferative disorder, CD40 ligand deficiency, Wiskott–Aldrich syndrome, X-linked agammaglobulinemia, and nuclear factor (NF) kB essential modulator (NEMO) deficiency. The optimal treatment for this disorder has not been determined. Until the date, the treatment of ICL is mainly symptomatic, with emphasis on prevention and treatment of opportunistic infections. Some novel approaches like allogenic BM transplantation, IL-2 administration has been tried in adult patients and may prove beneficial in the future. The natural history of ICL is variable. Though most reports suggest that these patients have a stable course unlike HIV/AIDS, but mortality remains at high probability due to the recurrent serious opportunistic infections. According to the report by Wilhelm in 2001, several different phases of an immunologic disorder have responded to IL-2 therapy. A third phase involved IL-2 therapy with alleviation of the major disease manifestations. CD4 T cells increased and the monoclonal gammopathies and creatinine levels decreased. Autoimmune manifestations are frequent and often multiple in patients with PID. The diagnosis of PID should be made early in disease evolution since it may influence the therapeutic strategy. ICL although a rare entity, should be included in the differential diagnosis of unexplained opportunistic infections and suspected T-cell disorder. Centers for Disease Control (CDC). Update: CD4+T-lymphocytopenia in persons without evident HIV infection – United States. MMWR Morb Mortal Wkly Rep 1992;41:578-9. From the centers for disease control. Update: CD4+T-lymphocytopenia in persons without evident HIV infection – United States. JAMA 1992;268:1252. Kanno H, Sasaki M, Kumagai H, Endo M, Chida S, Sawai T, et al. Epstein – Barr virus-positive malignant lymphoma of salivary gland developing in an infant with selective depletion of CD4-positive lymphocytes. Leuk Lymphoma 2007;48:183-6. Tanaka S, Teraguchi M, Hasui M, Taniuchi S, Ikemoto Y, Kobayashi Y, et al. Idiopathic CD4+T-lymphocytopenia in a boy with down syndrome. Report of a patient and a review of the literature. Eur J Pediatr 2004;163:122-3. Pasic S, Minic P, Dzudovic S, Minic A, Slavkovic B. Idiopathic CD4+lymphocytopenia and juvenile laryngeal papillomatosis. Pediatr Pulmonol 2005;39:281-3. Smith DK, Neal JJ, Holmberg SD. Unexplained opportunistic infections and CD4+T-lymphocytopenia without HIV infection. An investigation of cases in the United States. The centers for disease control idiopathic CD4+T-lymphocytopenia task force. N Engl J Med 1993;328:373-9. Phillips AN, Lee CA, Elford J, Janossy G, Timms A, Bofill M, et al. Serial CD4 lymphocyte counts and development of AIDS. Lancet 1991;337:389-92. Veugelers PJ, Schechter MT, Tindall B, Moss AR, Page KA, Craib KJ, et al. Differences in time from HIV seroconversion to CD4+lymphocyte end-points and AIDS in cohorts of homosexual men. AIDS 1993;7:1325-9. Muñoz A, Schrager LK, Bacellar H, Speizer I, Vermund SH, Detels R, et al. Trends in the incidence of outcomes defining acquired immunodeficiency syndrome (AIDS) in the multicenter AIDS cohort study: 1985-1991. Am J Epidemiol 1993;137:423-38. Masur H, Ognibene FP, Yarchoan R, Shelhamer JH, Baird BF, Travis W, et al. CD4 counts as predictors of opportunistic pneumonias in human immunodeficiency virus (HIV) infection. Ann Intern Med 1989;111:223-31. Phillips AN, Pezzotti P, Lepri AC, Rezza G. CD4 lymphocyte count as a determinant of the time from HIV seroconversion to AIDS and death from AIDS: Evidence from the Italian seroconversion study. AIDS 1994;8:1299-305. Crowe SM, Carlin JB, Stewart KI, Lucas CR, Hoy JF. Predictive value of CD4 lymphocyte numbers for the development of opportunistic infections and malignancies in HIV-infected persons. J Acquir Immune Defic Syndr 1991;4:770-6. Schwartländer B, Horsburgh CR Jr., Hamouda O, Skarabis H, Koch MA. Changes in the spectrum of AIDS-defining conditions and decrease in CD4+lymphocyte counts at AIDS manifestation in Germany from 1986 to 1991. AIDS 1992;6:413-20. Van Leeuwen R, van den Hurk PH, Mulder JW, Opportunistic infections as measure of immunodeficiency in human immunodeficiency virus (HIV) infection. In Janossy G, Autran B, Miedema F, editors. Immunodeficiency in HIV-1 Infections and AIDS. EC/FERS/MRC Workshop tm Immunodeficiency in HIV-1 Infections, Windsor, Surrey, 1991. Basel: Karger; 1992. Pedersen C, Gerstoft J, Tauris P, Lundgren JD, Gøtzsche PC, Buhl M, et al. Opportunistic infections and malignancies in 231 Danish AIDS patients. AIDS 1990;4:233-8. Miró JM, Buira E, Mallolas J, Gallart T, Moreno A, Zamora L, et al. CD4+lymphocytes and opportunistic infections and neoplasms in patients with human immunodeficiency virus infection. Med Clin (Barc) 1994;102:566-70. Laurence J, Mitra D, Steiner M, Lynch DH, Siegal FP, Staiano-Coico L, et al. Apoptotic depletion of CD4+T cells in idiopathic CD4+T lymphocytopenia. J Clin Invest 1996;97:672-80. Roger PM, Bernard-Pomier G, Counillon E, Breittmayer JP, Bernard A, Dellamonica P, et al. Overexpression of fas/CD95 and fas-induced apoptosis in a patient with idiopathic CD4+T lymphocytopenia. Clin Infect Dis 1999;28:1012-6. García-Silva J, Almagro M, Peña C, López Calvo S, Castro A, Soriano V, et al. CD4+T-lymphocytopenia, kaposi's sarcoma, HHV-8 infection, severe seborrheic dermatitis, and onychomycosis in a homosexual man without HIV infection. Int J Dermatol 1999;38:231-3. Hernández DE, Fernández L, Azuaje C, Tassinari P. Idiopathic CD4+T-cell lymphocytopenia syndrome associated with immunodeficiency diseases. Sangre (Barc) 1999;44:392-3. Longo F, Hébuterne X, Michiels JF, Maniere A, Caroli-Bosc FX, Rampal P, et al. Multifocal MALT lymphoma and acute cytomegalovirus gastritis revealing CD4 lymphopenia without HIV infection. Gastroenterol Clin Biol 1999;23:132-6. Quiles I, Anaut P, Cibrián F, Gainzaráin J, Vega L, Andía A, et al. Idiopathic CD4+T-lymphocytopenia with opportunistic infection and non-Hodgkin's lymphoma. J Intern Med 1995;238:183-4. Spira TJ, Jones BM, Nicholson JK, Lal RB, Rowe T, Mawle AC, et al. Idiopathic CD4+T-lymphocytopenia – An analysis of five patients with unexplained opportunistic infections. N Engl J Med 1993;328:386-92. Zonios DI, Falloon J, Bennett JE, Shaw PA, Chaitt D, Baseler MW, et al. Idiopathic CD4+lymphocytopenia: Natural history and prognostic factors. Blood 2008;112:287-94. Zonios D, Sheikh V, Sereti I. Idiopathic CD4 lymphocytopenia: A case of missing, wandering or ineffective T cells. Arthritis Res Ther 2012;14:222. Kuijpers TW, Ijspeert H, van Leeuwen EM, Jansen MH, Hazenberg MD, Weijer KC, et al. Idiopathic CD4+T lymphopenia without autoimmunity or granulomatous disease in the slipstream of RAG mutations. Blood 2011;117:5892-6. Li FY, Chaigne-Delalande B, Kanellopoulou C, Davis JC, Matthews HF, Douek DC, et al. Second messenger role for mg2+revealed by human T-cell immunodeficiency. Nature 2011;475:471-6. Gorska MM, Alam R. A mutation in the human uncoordinated 119 gene impairs TCR signaling and is associated with CD4 lymphopenia. Blood 2012;119:1399-406. Walker UA, Warnatz K. Idiopathic CD4 lymphocytopenia. Curr Opin Rheumatol 2006;18:389-95. Netea MG, Brouwer AE, Hoogendoorn EH, Van der Meer JW, Koolen M, Verweij PE, et al. Two patients with cryptococcal meningitis and idiopathic CD4 lymphopenia: Defective cytokine production and reversal by recombinant interferon- gamma therapy. Clin Infect Dis 2004;39:e83-7. Lebranchu Y, Thibault G, Degenne D, Bardos P. Abnormalities in CD4+T lymphocyte subsets in patients with common variable immunodeficiency. Clin Immunol Immunopathol 1991;61:83-92. Isgrò A, Sirianni MC, Gramiccioni C, Mezzaroma I, Fantauzzi A, Aiuti F, et al. Idiopathic CD4+lymphocytopenia may be due to decreased bone marrow clonogenic capability. Int Arch Allergy Immunol 2005;136:379-84. Frühwirth M, Clodi K, Heitger A, Neu N. Lymphocyte diversity in a 9-year-old boy with idiopathic CD4+T cell lymphocytopenia. Int Arch Allergy Immunol 2001;125:80-5. Salit RB, Hankey KG, Yi R, Rapoport AP, Mann DL. Detection of CD4(+) T-cell antibodies in a patient with idiopathic CD4 T lymphocytopenia and cryptococcal meningitis. Br J Haematol 2007;139:133-7. Fauci AS. CD4+T-lymphocytopenia without HIV infection – No lights, no camera, just facts. N Engl J Med 1993;328:429-31. Sheppard H, Winkelstein W, Lang W, Charlebois E, Heymann DL, Belsey E, et al. CD4CT-lymphocytopenia without HIV infection. N Engl J Med 1993;328:1847-50. Aldrich J, Gross R, Adler M, King K, MacGregor RR, Gluckman SJ. et al. The effect of acute severe illness on CD4C lymphocyte counts in nonimmunocompromised patients. Arch Intern Med 2000;160:715-6. Busse PJ, Cunningham-Rundles C. Primary leptomeningeal lymphoma in patient with concomitant CD4Clymphocytopenia. Ann Allergy Asthma Immunol 2002;88:339-42. Nakahira M, Matsumoto S, Mukushita N, Nakatani H. Primary aspergillosis of the larynx associated with CD4+T lymphocytopenia. J Laryngol Otol 2002;116:304-6. Stetson CL, Rapini RP, Tyring SK, Kimbrough RC. CD4+T lymphocytopenia with disseminated HPV. J Cutan Pathol 2002;29:502-5. Etienne M, Gueit I, Abboud P, Pons JL, Jacquot S, Caron F, et al. Fusobacterium nucleatum hepatic abscess with pylephlebitis associated with idiopathic CD4(+) T lymphocytopenia. Clin Infect Dis 2001;32:326-8. Matsuyama W, Tsurukawa T, Iwami F, Wakimoto J, Mizoguchi A, Kawabata M, et al. Two cases of idiopathic CD4+T-lymphocytopenia in elderly patients. Intern Med 1998;37:891-5. Seligmann M, Autran B, Rabian C, Ferchal F, Olive D, Echard M, et al. Profound and possibly primary “idiopathic CD4+T lymphocytopenia” in a patient with fungal infections. Clin Immunol Immunopathol 1994;71:203-7. Ohashi DK, Crane JS, Spira TJ, Courrege ML. Idiopathic CD4+T-cell lymphocytopenia with verrucae, basal cell carcinomas, and chronic tinea corporis infection. J Am Acad Dermatol 1994;31:889-91. Duncan RA, von Reyn CF, Alliegro GM, Toossi Z, Sugar AM, Levitz SM, et al. Idiopathic CD4+T-lymphocytopenia – Four patients with opportunistic infections and no evidence of HIV infection. N Engl J Med 1993;328:393-8. Hardman CM, Baker BS, Lortan J, Breuer J, Surentheran T, Powles A, et al. Active psoriasis and profound CD4+lymphocytopenia. Br J Dermatol 1997;136:930-2. Grossman D, Lewis DE, Ballas ZK, Duvic M. Idiopathic CD4+T lymphocytopenia in a patient with mycosis fungoides. J Am Acad Dermatol 1994;31:275-6. Goodrich AL, Tigelaar RE, Watsky KL, Heald PW. Idiopathic CD4+lymphocyte deficiency. Report of an unusual case associated with atopic dermatitis and allergic contact dermatitis and review of the literature. Arch Dermatol 1993;129:876-8. Wakeel RA, Urbaniak SJ, Armstrong SS, Sewell HF, Herriot R, Kernohan N, et al. Idiopathic CD4+lymphocytopenia associated with chronic pruritic papules. Br J Dermatol 1994;131:371-5. Manchado Lopez P, Ruiz de Morales JM, Ruiz González I, Rodriguez Prieto MA. Cutaneous infections by papillomavirus, herpes zoster and Candida albicans as the only manifestation of idiopathic CD4+T lymphocytopenia. Int J Dermatol 1999;38:119-21. Ho DD, Cao Y, Zhu T, Farthing C, Wang N, Gu G, et al. Idiopathic CD4+T-lymphocytopenia – Immunodeficiency without evidence of HIV infection. N Engl J Med 1993;328:380-5. Vitale M, Zimmer J, Castriconi R, Hanau D, Donato L, Bottino C, et al. Analysis of natural killer cells in TAP2-deficient patients: Expression of functional triggering receptors and evidence for the existence of inhibitory receptor(s) that prevent lysis of normal autologous cells. Blood 2002;99:1723-9. Orange JS. Human natural killer cell deficiencies and susceptibility to infection. Microbes Infect 2002;4:1545-58. Petersen EJ, Rozenberg-Arska M, Dekker AW, Clevers HC, Verdonck LF. Allogeneic bone marrow transplantation can restore CD4+T-lymphocyte count and immune function in idiopathic CD4+T-lymphocytopenia. Bone Marrow Transplant 1996;18:813-5. Cunningham-Rundles C, Murray HW, Smith JP. Treatment of idiopathic CD4 T lymphocytopenia with IL-2. Clin Exp Immunol 1999;116:322-5.